Touchstone, with its first analog power management product, has enhanced such a function with the capability to use supply voltages down to 0.6V while still being able to deliver a 75 mA output current. The device can be used in power harvesting or peak load buffering applications, the LDO may post-regulate voltage buffered in a large capacitor or super-capacitor at boost’s output. 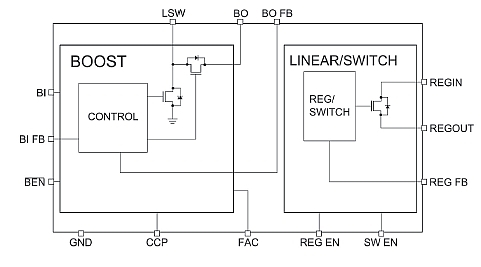 Finally, the LDO may be operated simply as an on/off load switch. This entry was posted on Friday, May 31st, 2013 at 2:39 am	and is filed under kit biz. You can follow any responses to this entry through the RSS 2.0 feed. You can skip to the end and leave a response. Pinging is currently not allowed.